I am seeing a lot of e-mails recently similar to the one below. They indicate that there is some sort of suppension on your account due to suspicious activity and what not. They are very poorly done with the from address not even close to the one it is supposed to be coming from and the “Click Here” and other links pointing to a basic IP address. 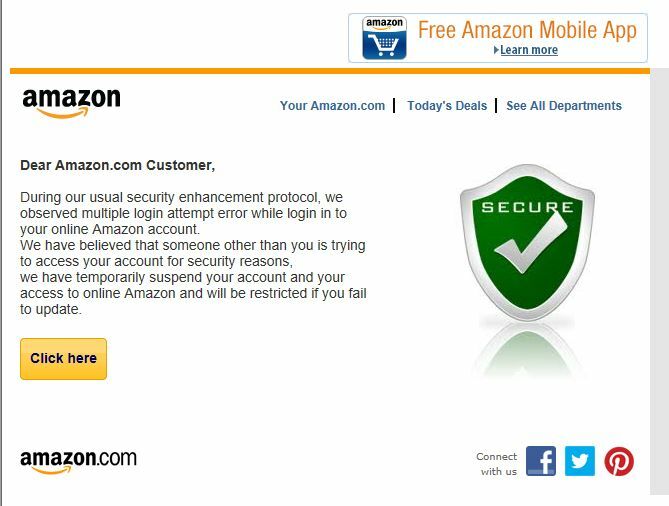 The one below is faking an Amazon e-mail but I have seen them faking Itunes and I suspect other ones will crop up as well. Please do not click on any of the links in these e-mail they are designed for the sole purpose of stealing your information and / Or installing a malware or virus on your system.